At Smiles by Martin in Grapevine, we create personalized dental care plans for every patient we treat. No two patients or smiles are exactly alike but visiting us every six months for dental checkups and cleanings is important for every patient we treat. If it’s been six months or longer since your last dental checkup, call our Grapevine dentistry team to schedule an appointment with us today. We look forward to partnering with you to achieve and maintain the optimal level of oral health for a lifetime. During the first world war, more men were prevented from entering the military due to poor oral health than any other medical reason. At the time, a group of dentists got together to determine how they could help Americans improve their oral health. They decided visiting the dentist regularly for preventive exams and teeth cleanings was the key to improving smile health. Since then, dentists have encouraged patients to keep up with these checkups, and dental hygiene and health in the US have significantly improved. In addition to helping patients keep their smiles whole and avoid advanced dental health concerns, visiting the dentist every six months also ensures you maximize your dental insurance benefits. These appointments are traditionally covered between 80 and 100% by dental benefit policies. Dental checkups and teeth cleanings are also the best way to avoid more advanced dental health concerns that require dentistry services that receive less insurance coverage. 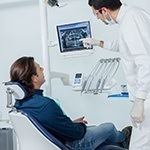 What Happens During Checkups at Smiles by Martin? I Brush & Floss at Home – Do I Need Professional Teeth Cleanings? Yes. Even the most diligent brushing and flossing may not be enough to remove plaque from every surface. Some teeth have pits and grooves so small that even a single toothbrush bristle can’t access them. Additionally, plaque begins to harden into calculus or tartar in just 12 hours. Tartar has to be removed professionally. For these reasons and so many more, professional teeth cleanings are an essential aspect of your preventive dental exams. Your hygienist is also an essential resource to help you find the right at-home hygiene products and maximize your dental care techniques, so don’t hesitate to ask for advice.